Snowmageddon '11 came and went, leaving behind 5 foot drifts, countless school closings and stranded cars galore, it also left me with a renewed outlook on friendship and community. Ironically, the week before the blizzard, I was really in a very different place. Amazing that a snow crisis could change that. My family and I had some really bad interactions with other people that week, some of which were pretty appalling. For instance, in the Target parking lot, a man pulled out from his spot to practically run my daughter and I over. After I grabbed my daughter by the hood of her coat and threw her out of the way as I screamed for him to stop, I told him he almost hit us and he should pay better attention while driving. He did not apologize, in fact snarkily told me he should have hit me instead! The same day, my cousin told me a story of her neighbors who parked in front of their house and refused to move when she asked. Even after she told them her mother, who had gone through 6 hours of chemo, was coming home and would appreciate a spot closer to the house to make it easier for her. How atrocious was that? Add that to the news in general, the shooting tragedy in Arizona and how certain people in the media responded to it, and I really felt this civility in this country was going the way of the dinosaurs! Enter the blizzard of 2011. 24 inches of snow is nothing new for the city of Chicago. But the amount of snow in such a short time was not seen in this neck of the woods since 1999. And it is crisis like this that really shows the true nature of people. The city does not plow alleys, and for many of us, the city's alleys are the only way to get out of our garages, and get through the city quickly. When we woke up the next morning, the blizzard was waning but our alley was under three to four feet of snow drifts. No one was getting out, especially if we waited for the city to get us out. The neighbors on our end of the alley banded together and with our shovels and snow plows, cleared out half of the alley. My husband invested in a 5 horse power machine and he was making quick work out of the drifts. So much so that he decided to clear out the area around an elderly couple's house and the front walks of our side of the street. We all worked together for 6 hours. 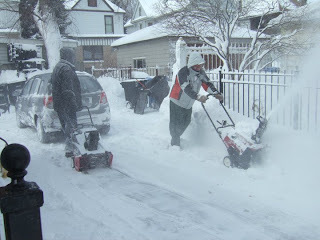 Then the neighbors on the other end borrowed the blowers so they could clear out the other side of the alley. This way, we could ALL be mobile once the city cleared out the front street. Later that evening, exhausted and sore, the doorbell rang and one neighbor baked my husband some cookies as a thank you for the snow blowing. The next morning, a neighbor who's carport we cleared without being asked dropped off a thank you note with a bottle of wine (helpful for sore muscles!). Our block was not alone. All over the city there were stories of neighbors helping neighbors. For instance, Lake Shore Drive looked like a scene from an apocalyptic movie, with cars and buses stranded and buried in snow for miles. There were people stuck in their cars for up to 4 hours. Many people left there cars and just began walking miles home in the blizzard. People who lived around the area went to bring blankets, food and water until emergency vehicles could evacuate the motorists. Buses kept there engines and heat on, letting stranded motorists stay warm and safe inside. Many people, my sister included, helped to push many motorists, stuck in the snow so they could get home. So it seems, the city of "Big Shoulders" STILL has big shoulders... strong enough for all of us to lean on each other. 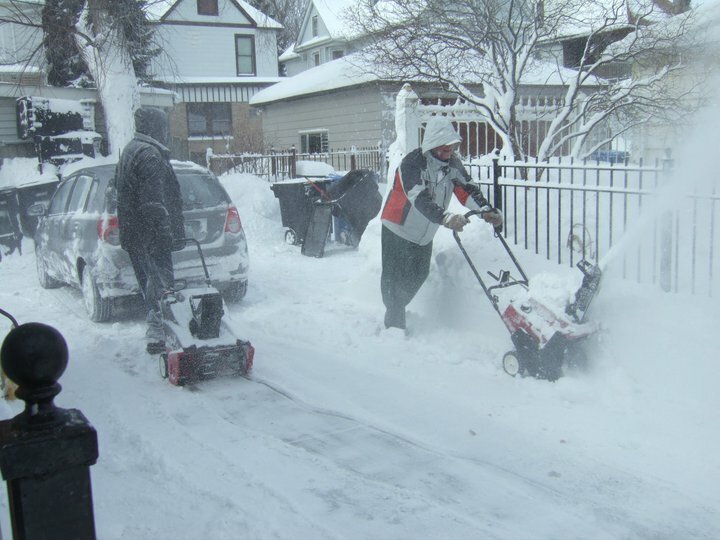 They might be a little sore from the shoveling, but that spirit is still alive and well in Chi-town.